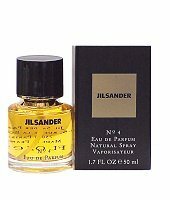 Jil Sander introduced Jil Sander No. 4 in 1990. This fine fragrance contains rose, geranium, peach and is accented with tarragon, moss and carnation. Jil Sander No. 4 is recommended for formal use.